Please CLICK HERE to Download ROFFS™ Press Release as a PDF. Please CLICK HERE to Download the ROFFS™ NASA Hurricane Harvey Project Final Report. 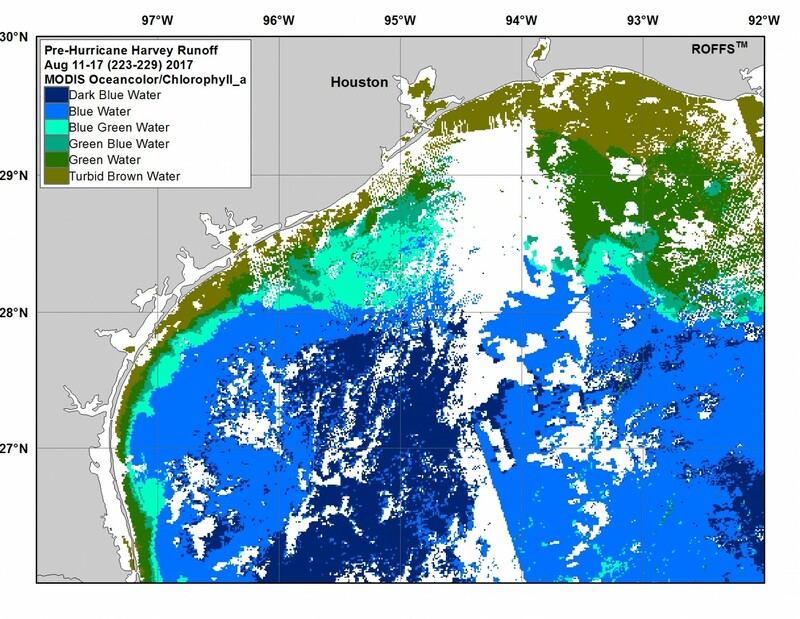 This project succeeded in tracking, mapping and spatially analyzing the freshwater plume runoff in the northwest Gulf of Mexico resulting from Hurricane Harvey hitting the Texas coast on August 25, 2017 using a combination of ocean color and infrared satellite imagery. Twenty-four weeks of satellite data were derived from NASA, NOAA and the European Space Agency (ESA) using a variety of polar orbiting platforms. 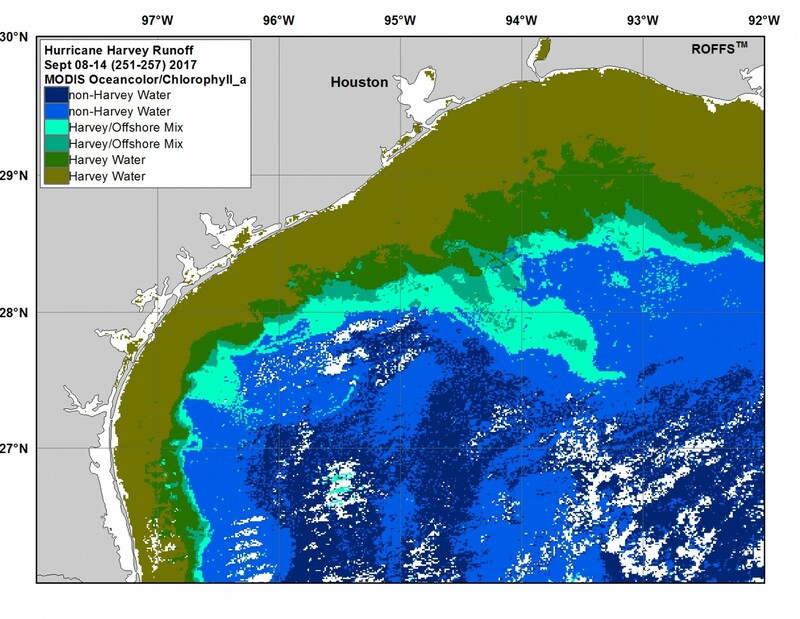 It was determined that the freshwater plume signal, derived primarily from sea surface derived chlorophyll measurements, had a surface area expansion peak and mean of 2.14 and 1.57 times the pre-storm mean within the northwest Gulf of Mexico. 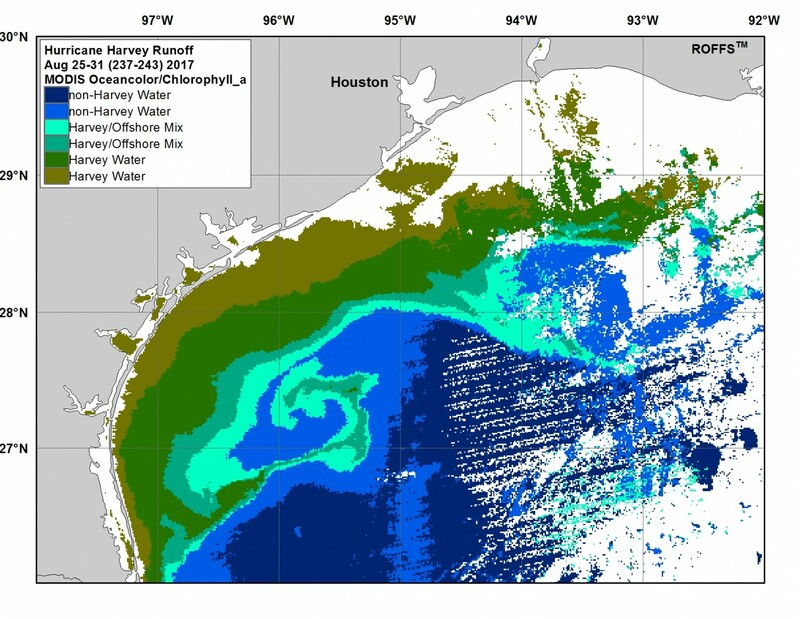 Weekly summaries and geo-referenced maps and results are provided on the ROFFS™ website (https://www.roffs.com/research-environmental/monitoring-hurricane-harvey-plume-gulf-mexico/) and have been publicized widely through social media, press releases, and ROFFS™ newsletter. The results are being sent directly to a variety of agencies and fisheries managers via email. In addition, the distribution included fishers, as well as, the general public including educators and government representatives. The data is available via ROFFS™ website or upon request (fish7@roffs.com, 321-723-5759). Fisheries managers need to know the spatial and temporal extent of the plume, which will assist them to evaluate which stocks are likely to be affected and what management strategies need to be modified in light of this disturbance. The beneficial impact to fisheries managers is that the derived environmental data is available for use for everyone including stock assessment scientists. 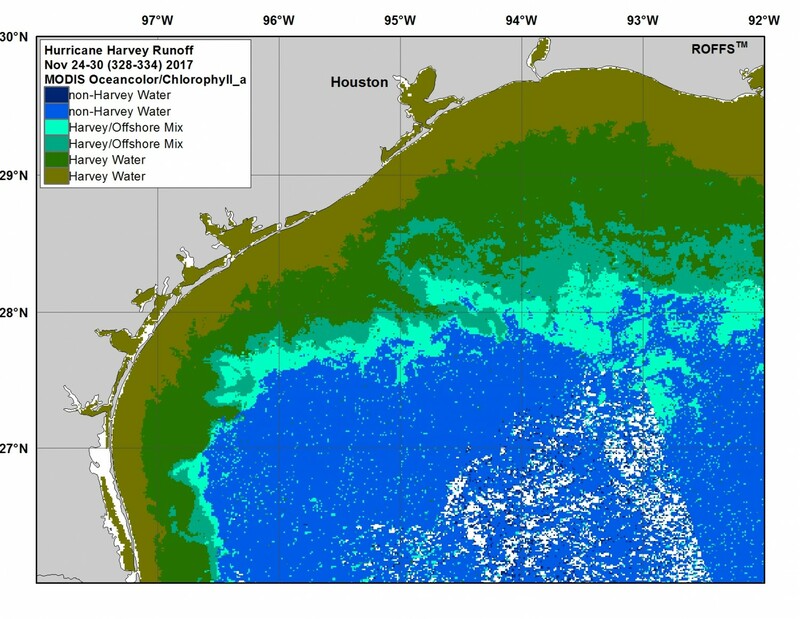 Incorporating these environmental conditions should result in improved stock assessments and fisheries management in this region due to the effects of Hurricane Harvey. This research is of high significance and likely to have a long-lasting impact due to the increased understanding of such events on the short-term and long-term impacts of tropical events on the fauna and flora in the northwest Gulf of Mexico, along with the transport and fate of the polluted water offshore. 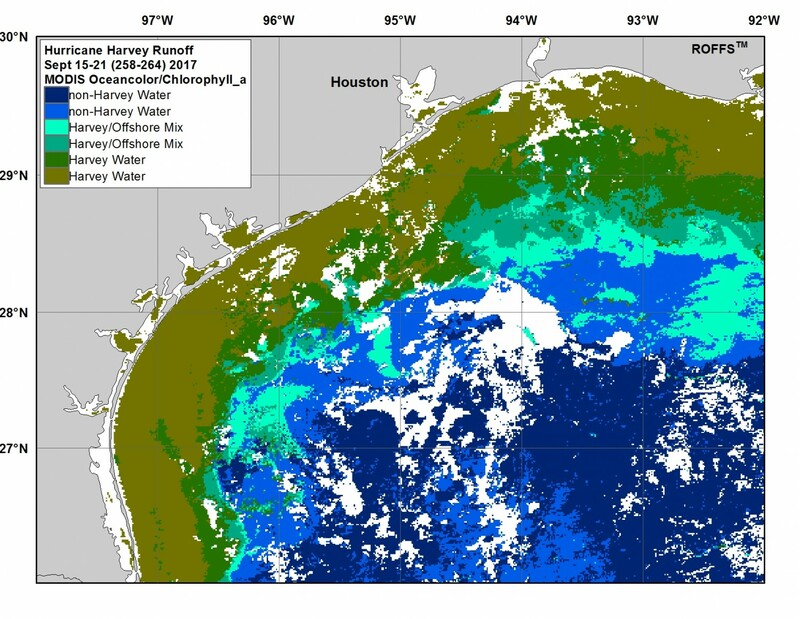 By tracking the surface ocean color – chlorophyll signal in the northwest Gulf of Mexico, we also mapped the distribution and concentration of terrestrial and ocean carbon fluxes, which is critical in understanding the carbon cycle through the ocean ecosystem and back to the atmosphere. 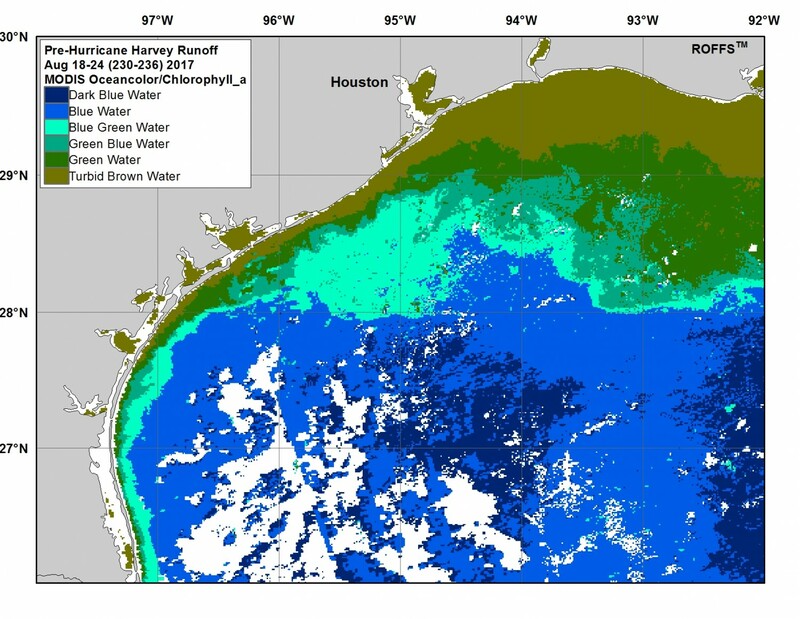 Results of this project have showed that ocean color satellites in particular were useful in identifying, mapping and monitoring the weekly freshwater plume runoff in the northwestern Gulf of Mexico due to the increased chlorophyll + CDOM signature of the runoff that resulted from this extreme rainfall event. Infrared satellites and the ocean color satellites were also useful in tracking the Lagrangian coherent structures of the signature water masses for diagnosing the ocean’s surface dynamics. 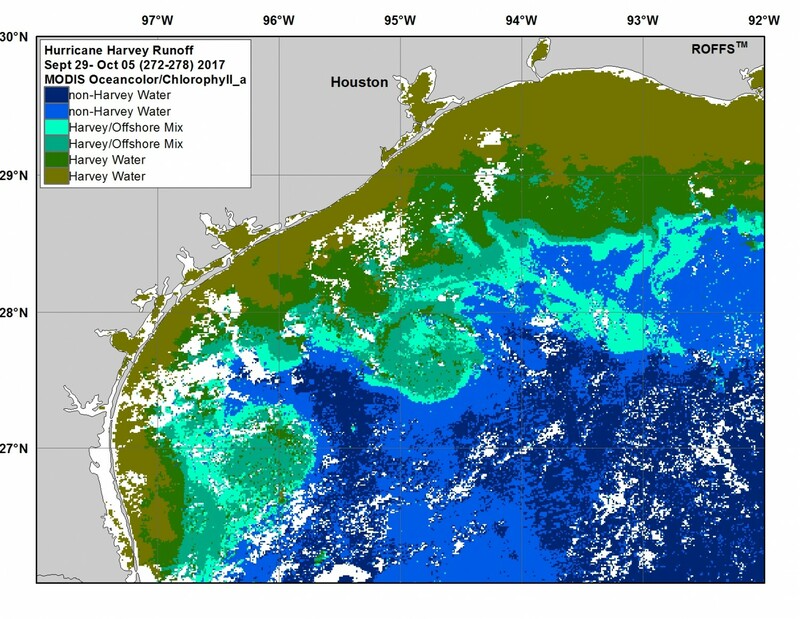 Furthermore, as expected, results of ArcGIS spatial analysis of the direct Hurricane Harvey runoff extents showed a gradual increase in effected surface area within the northwest Gulf of Mexico until mid-October, 2017. Then one can argue it remained at or near peak surface area coverage until mid-to-late November before slightly overall decline in surface area until the end of the study period (February 01, 2018). 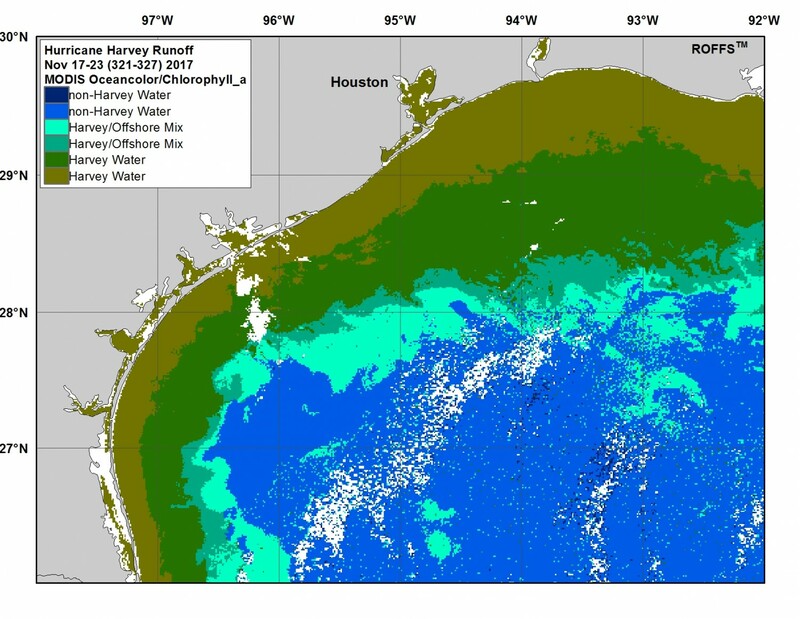 It is of note, as we continued to follow the ocean conditions, the surface area of the Hurricane Harvey defined water did continue to decrease overall into the spring and all but mix out and disperse by early summer months, especially offshore. 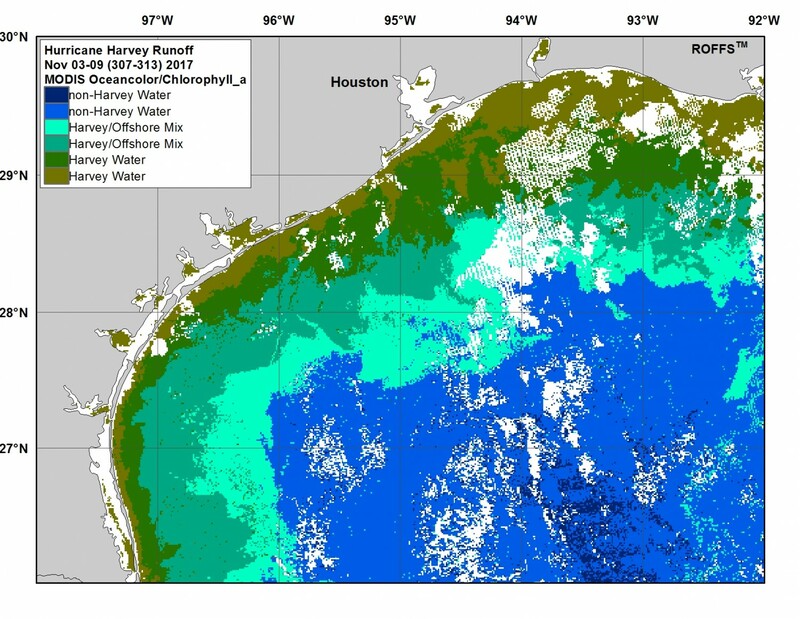 It is shown and verified in this work by the increase in the extent of the direct Hurricane Harvey water that the amount of rain, subsequent flooding and runoff into the Gulf of Mexico from this hurricane is an environmental concern due to its impacts on the ecosystems of the fauna and flora of the coastal and offshore ocean. Not only is freshwater input with its turbidity and increased chlorophyll + colorized dissolved organic matter (CDOM) of concern, but the industrial and domestic household chemicals causing pollution in the water are of concern and is likely imbedded within this satellite derived Hurricane Harvey water extents defined in this project. 1) Why The Proposed Research Is Of An Urgent Nature. Regardless of the rainfall records and storm surge differential between Harvey and Katrina, the amount of rain, subsequent flooding and runoff into the ocean from Hurricane Harvey is of concern due to its impacts on the fauna and flora of the coastal ocean. Not only is freshwater input with its turbidity and increased chlorophyll + colorized dissolved organic matters of concern, but the industrial and domestic household chemicals in the water are of worry as well (Tabuchi, 2017). Thus, mapping the freshwater plume and algae bloom is of urgent concern. Figure 1 shows the dramatic changes in the ocean color, an index of the algae blooms, i.e. increased chlorophyll and colored dissolved organic matter (CDOM), turbidity, and a proxy for fresh water. Figure 1. NASA MODIS Aqua ocean color image comparison of the conditions before (left) and immediately after (right) Hurricane Harvey from Texas to Louisiana. 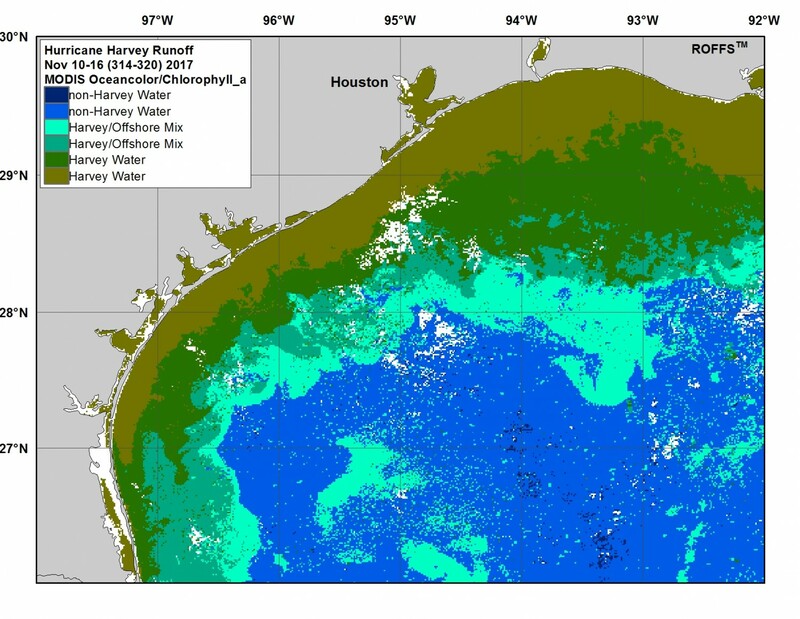 The dramatic difference in the amount of green – high chlorophyll water is substantially different off the Texas coast. The impact of hurricanes on marine ecosystems and coastal areas is well documented (Burgess et al. 2007; Conner et al. 1989 and NMFS, 2007, among others). These episodic events degrade the habitat. As the habitat degrades or is reduced in area, such degraded habitat can limit the quantity or quality of fishery resources in three ways: 1) by limiting suitable space, shelter, vital nutrients, or food; 2) by interfering with physiological functioning or reproduction via contamination; or 3) by contaminating the tissues of fishery species. Fisheries managers need to know immediately which stocks are likely to be affected in both the short-term and longer time frames. They also need to know which management strategies need to be modified as a result of this disturbance. Tropical storms have been known to cause significant short-term biological effects by redistributing species or forcing them to migrate and longer-term effects such as smothering oyster beds, reducing the recovery rate of corals, and changing the recruitment success from eggs to juveniles (Burgess et al. 2007; NMFS 2007). However, extensive studies on the longer-term effects are not well studied (Conner et al., 1989, NMFS, 2007) and thus in light of this major – Category 5 storm, there is a critical need for the proposed work. Recently, the Government Accountability Office’s report to the U.S. Congress (GAO, 2016) highlighted the gaps in the fishing community and fisheries managers’ understanding of the effects of environmental variability on the catchability (vulnerability and availability), as well as, changes in the distribution, seasonal timing, and recruitment of marine resources. The effect of freshwater on marine and coastal species is important when understanding the changes in the distribution, recruitment (egg and larvae survival), trophic interactions, species dominance and the survival of ocean species including fish, marine mammals, turtles, and the coral ecosystem in the Northwest Gulf of Mexico and elsewhere. Knowing the distribution and time history of the freshwater coming from the Texas mainland after Hurricane Harvey is critical information for fisheries managers for understanding changes in abundance, apparent abundance (including total catch, catch rate), and the distribution of catch. Additionally, the effect of freshwater on marine and coastal species is important when considering that many of the species of interest (e.g. marine mammals, turtles, and corals, etc.) in the western Gulf of Mexico are protected via various Gulf of Mexico fishery management plans and international fisheries management agreements. The protected species also occur in both the shallow and deeper water habitats in the Gulf of Mexico. Nearshore habitats are used by nine of 23 protected species, including bottlenose dolphin (Tursiops truncatus) and Atlantic spotted dolphin (Stenella frontalis) (NMFS, 2007). The bottlenose and Atlantic spotted dolphins are the most commonly found species in nearshore waters, along with sea turtles. Protected species, such as the Atlantic bluefin tuna (Thunnus thynnus) use the Gulf of Mexico as their primary spawning grounds. Our research (Muhling et. al., 2015, Muhling et. al., 2016) indicates that they and other tuna billfish species are bound by particular habitat preferences particularly ocean color- chlorophyll concentration and water temperature. Changes in the distribution and concentration of these ocean properties will impact the distribution of spawners of bluefin tuna and many other related species affected by the change in habitat conditions. The East and West Flower Garden Banks located on the outer edge of the continental shelf, respectively 120 miles and 107 miles southeast of Galveston, Texas, are of concern as well. They have been designated as a National Marine Sanctuary and are in the range of being affected by the Hurricane Harvey freshwater plume. The Flower Garden Banks are considered near the northern physiological limits for tropical hermatypic corals in the Gulf of Mexico and are the northernmost thriving tropical coral reefs on the North American continental shelf (Rezak et al. 1985). The corals have very a specific physio-chemical habitat and the plume water could have a negative impact on the coral’s health. In addition, understanding the transport of freshwater and the associated turbidity and algae blooms resulting from hurricanes are of interest when evaluating the transport of coastal carbon offshore. Tracking and mapping the extent of this water with a combination of ocean color and infrared imagery along with spatial analysis is necessary and relatively easily achieved to provide this critically needed information for future studies. And Likely To Have A Long-Lasting Impact. This proposed research will improve the understanding of the short-term and long-term impacts of tropical storm events on the fauna and flora in the Northwest Gulf of Mexico, along with the transport and fate of domestic chemicals, and carbon offshore. The beneficial impacts to fisheries managers are that the derived data, i.e., temporal and spatial coverage of the freshwater – enhanced chlorophyll + CDOM plume provided by this project will allow for the development of quantitative catchability indices (q) for stock assessment calculations. The Magnuson-Stevens Fishery Conservation mandates the use of environmental data in stock assessments and Management Act (MSFCMA, 1976) in ecosystem based fisheries management. Incorporating the environmental conditions will result in improved stock and recruitment assessments and fisheries management. Thus, this research is of high significance and likely to have a long-lasting impact. Such catchability indices are essential for reducing the variability introduced by a fluctuating environment in stock assessment calculations (Ingram et. al., 2017). Understanding the source of changes in the ocean environment will allow fisheries managers to differentiate between man-made changes in apparent abundance, as derived from fishing mortality, from those changes mediated by environmental variation. State and federal managers will better comprehend when and why specific species may be forced out or into their management jurisdiction from the changing habitat. Resource managers will be able to use these environmental indices derived from this project to advance their understanding of recruitment variations, including an improved interpretation of shifting centers of successful recruitment. Mangers will also be able to recognize the spatial and temporal changes in the predator-prey relationships as abundances and distributions adjust with changing environmental conditions. This will also enhance the science-based selection or non-selection of marine sanctuaries or other protected areas when looking to achieve certain management goals. The fish species and species groups likely to be affected by the Hurricane Harvey water include but are not limited to commercially and recreationally important fishes: herrings or shads (Clupeidae); Gulf menhaden (Brevoortia patronus); anchovies (Engraulidae), sea basss (Serranidae), gobies (Gobiidae), jacks (Carangidae), drums or croakers (Sciaenidae) and flounders (Bothidae), sea robins (Triglidae), snappers (Lutjanidae) and porgies (Sparidae), drum species including redfish (Sciaenops ocellatus), tarpon (Megalops atlanticus), mackerels and tunas (Scomridae) including king mackerel (Scomberomorus cavalla), Spanish mackerel (Scomberomorus maculatus), wahoo (Acanthocybium solandri), bluefin tuna, blackfin tuna (Thunnus atlanticus), along with the marlins, blue marlin (Makaira nigricans) and white marlin (Kajikia albidus). 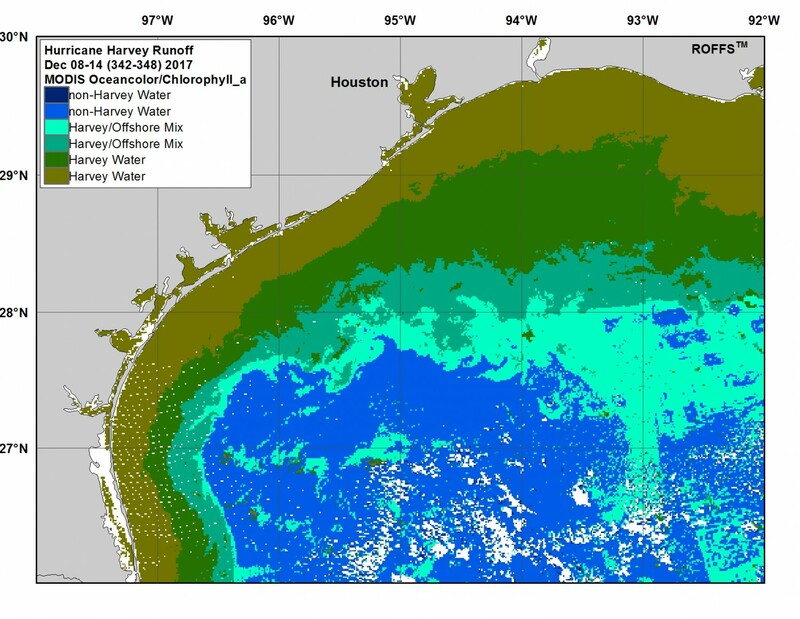 Additionally, mapping the chlorophyll + CDOM from such major tropical storms such as Hurricane Harvey on the distribution, concentration, and fluxes of ocean carbon is critical in understanding the mechanisms related to how carbon cycles through the ocean ecosystem and back to the atmosphere and how important is ocean carbon flux to the Earth’s carbon cycle. Also, it is anticipated that as a result of this project that the fisheries management community will realize the importance of the effect of major storms on the ocean environment and provide increased support for future ocean monitoring across the entire Gulf of Mexico and elsewhere. Mechanism To Request NASA Support For The Proposed Work. The Earth and particularly the ocean is a complex dynamic system that we do not fully understand. As the purpose of NASA’s Earth science program is to develop a scientific understanding of Earth’s system and its response to natural or human-induced changes, and to improve prediction of climate, weather, and natural hazards, NASA is the primary agency to support this work. A major component of NASA’s Earth Science Division is a coordinated series of satellite and airborne missions for long-term global observations and monitoring of the land surface, biosphere, solid Earth, atmosphere, and oceans. NASA is the agency that best supports the integration of land, atmospheric and ocean systems with satellite data. The National Oceanic and Atmospheric Administration (NOAA) and the Environmental Protection Agency (EPA) do not have the most efficient integrated programs that offer support for such responses to Hurricane Harvey. While NOAA’s U.S. Integrated Ocean Observing System (IOOS) monitors the ocean with a limited number of assets, they do not have a mechanism to respond quickly to this event. The National Science Foundation’s Rapid Response Research (RAPID) Program is of interest, but their documents (NSF, 2017) indicate that they are more interested in: 1) What was the contribution of the science investment to the creation and retention of jobs? ; 2) What was the contribution of the science investment to science and technology industries? ; 3) What scientific or technological advances were achieved? ; and 4) What was the impact on the scientific workforce? 4) Detailed Plan On Data Dissemination And Sharing. We will trace the water masses daily and provide weekly summaries in the form of text and graphics. These weekly summaries will be provided on the ROFFS™ website and publicized on social media (Facebook™, Twitter™, and Linkedin™) and the ROFFS™ Fishy Times e-newsletter (extensive free subscription distribution to primarily scientists, fisheries – managers and fishers, but also to the general public). In addition, we will distribute this information directly with the Gulf of Mexico Fishery Management Council, the South Atlantic Fishery Management Council, The Office of National Marine Sanctuaries including The Flower Garden National Marine Sanctuary Program, each state’s fisheries departments along with the NOAA National Marine Fisheries Service (NMFS) Southeast Fisheries Science Center laboratories in the Gulf of Mexico, as well as, the IOOS headquarters and the their regional association, the Gulf of Mexico Coastal Ocean Observing System. We will also solicit other agencies that have interests in the Gulf of Mexico such as the EPA, U.S. Geological Survey and the Bureau of Ocean Energy Management (BOEM) and the U.S. Office of Homeland Security – U.S. Coast Guard. We plan on submitting the results to a peer reviewed scientific publication and present our results to at least one national scientific conference. We will derive ocean color (derived chlorophyll and RGB) and infrared satellite data for the Gulf of Mexico from a variety of polar orbiting satellites including NASA’s MODIS Aqua and Terra, Suomi National Polar-orbiting Partnership (Suomi NPP), NOAA’s 15, 18, 19 satellites and the European (ESA) METOP (A and B) satellites. ESA’s Sentinel_3A satellite data will be used when available. While the satellite data are available from a variety of internet servers, we will be using data that has been formatted in a customized manner for ROFFS™ by the University of South Florida Institute for Marine Science (IMaRS) and the University of Delaware ORB Laboratory to facilitate analysis using our proprietary image processing and analysis software. 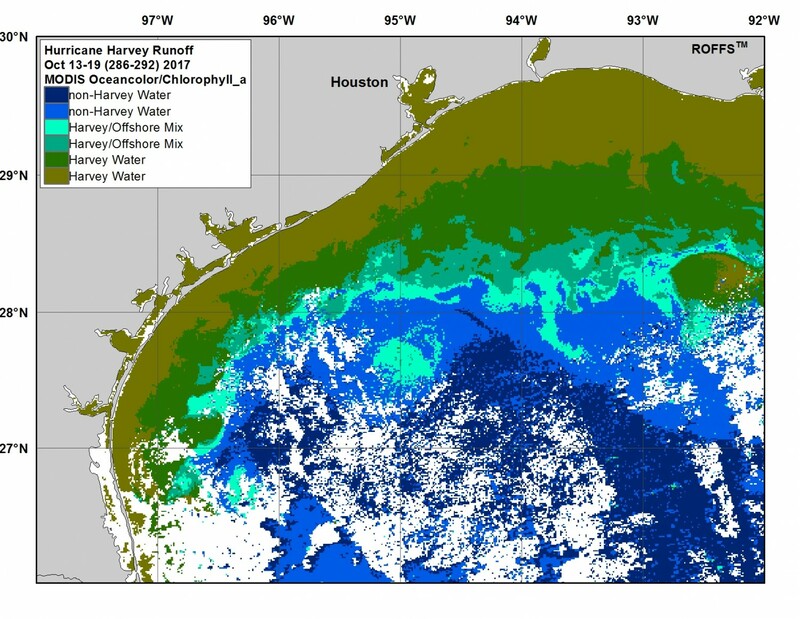 The satellite data and ROFFS™ sequential satellite image analysis will be used to identify the various water masses associated with the Hurricane Harvey freshwater output plume similar to how we tracked the water after the Deepwater Horizon oil spill (Goni et. al., 2015, Muhling et. al., 2012, Mariano et. al., 2011, Acker et. al., 2009) and Hurricane Katrina (ROFFS™, 2005). Basically we identify the signature water masses from either single satellite passes or daily composites and track the water masses using their Lagranian coherent structures. The water masses and extent from the Hurricane Harvey plume will be outlined similarly to the post Katrina analyses as shown in Figure 2. Weekly extents of the analyses will be converted into geo-referenced images using Esri’s ArcGIS. The spatial analysis using ArcGIS will then provide the derived surface area coverage of the water over time. When and if appropriate, as the water moves and mixes with the surrounding waters we will provide separate color classifications based on the higher and lower derived chlorophyll + CDOM concentration extents. The weekly summaries will be compared to evaluate the changes in the distribution and concentration of the water. A written oceanographic analysis including graphics and text will be distributed to a wide audience as described previously in Section 4. Based on our experience with tracking the contaminated water related to the Deepwater Horizon oil spill, the tracking the polluted water after Hurricane Katrina and Rita and our extensive knowledge and experience in satellite remote sensing projects this will be a four month tracking effort depending on the difficulty resulting from the mixing and dilution of the water and a function of the time it takes Hurricane Harvey plume being indistinguishable from the surrounding non-Harvey waters. The work will be a team effort of the Investigators. Mitchell Roffer (PI) has the overall responsibility for the project and for coordinating the efforts of the entire research team. Greg Gawlikowski will be the lead on the image processing and tracking the water masses. Matthew Upton will be the lead on the GIS conversion and spatial analysis. Our team has many years experience tracking water masses related to pollution and fisheries (e.g. Acker et. al., 2009 and Muhling et. al., 2012). Mitchell A. Roffer, satellite fisheries oceanographer (ROFFS™), the Principal Investigator (PI), has the overall responsibility for the project and for coordinating the efforts of the research team. He has been working with ocean frontal dynamics, highly migratory pelagic species fisheries oceanography and satellites for over 40 years and has been the PI for several NASA and NOAA projects in the Gulf of Mexico over the last 10 years related to habitat modeling, climate change, ocean modeling and the Deepwater Horizon oil spill. Gregory Gawlikowski, Fisheries Oceanographer, ROFFS™ specializes in satellite derived ocean frontal analyses for operational and research projects. He has experience working on two similar NASA projects and has worked well with this project’s personnel. He will be under the supervision of Mitchell Roffer, PI. Matthew Upton, Fisheries Oceanographer, ROFFS™ specializes in satellite derived ocean frontal analyses for operational and research projects and GIS experience. He has experience working on three similar NASA projects. He will be under the supervision of Mitchell Roffer, PI. Each investigator will keep their original data and weekly backups on external drives. For sharing data we have had favorable experience using Dropbox™ Internet cloud services during our last two NASA projects. Data needed by more than one researcher will be shared in this manner. G. Gawlikowski will be the lead on this as he has done this successfully in the past. The SST and ocean color/chlorophyll satellite data will be stored on the ROFFS™ server and available to all participants through a password-protected portal. Relatively small satellite data sets, individual images and weekly oceanographic summaries and maps of interest will be posted to ROFFS™ website (www.roffs.com). All presentations and accepted papers will be stored in this manner. Backup copies of all data, presentations, and publications will be stored on DropBox™ and available upon request. 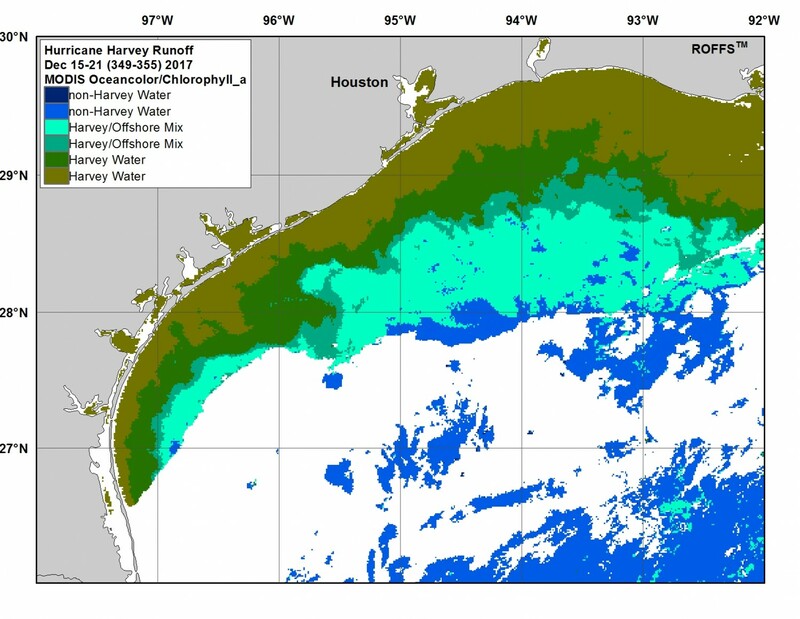 In order to summarize and finalize the monitoring of Hurricane Harvey freshwater plume runoff into the Northwest Gulf of Mexico, ROFFS™ added some brief dialog of the week-to-week progression and generalization of the runoff extents. This will concentrate mainly on the “green” and “turbid green” categories that together form the “Harvey Water” extents. The “Harvey/Offshore Mix” (green/blue + blue/green water) will also be discussed when appropriate. Week 1 (Aug 11-17): This image shows the conditions two weeks before Hurricane Harvey hit the coast of Texas. 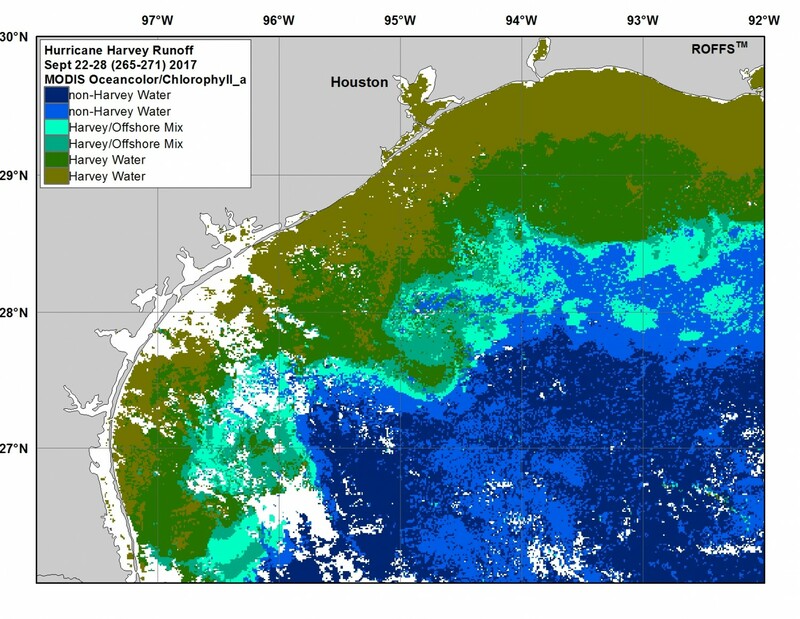 Of note is the relatively small extents of greener and turbid green water from South Padre Island and just offshore of Texas all the way to Houston/Galveston area. There were some trouble with cloud cover and satellite coverage this week. 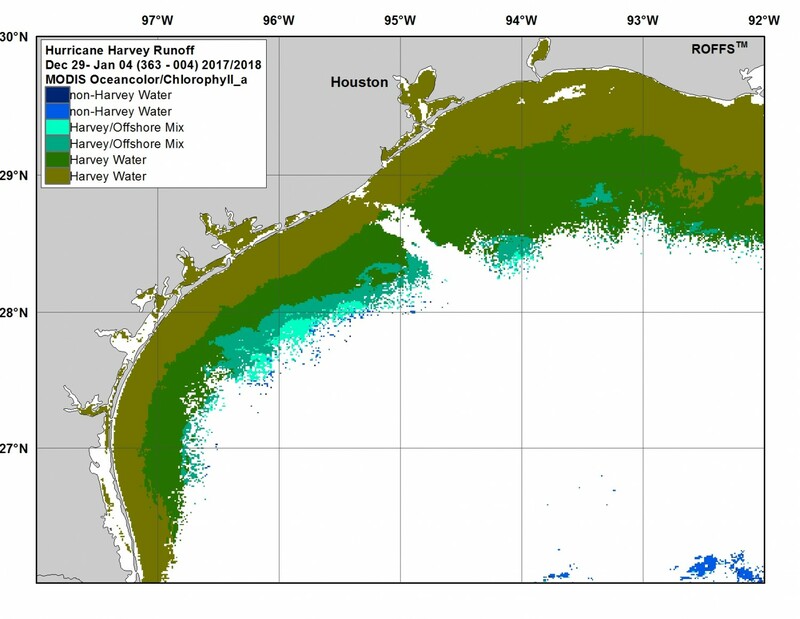 Week 2 (Aug 18-24): This week is only one week to a few days before the landfall of Harvey, and one continues to notice the relatively thin extents of greener and turbid brown water along the coast of Texas up to the Houston/Galveston area. Then the extent of greener and turbid brown water reaches further offshore from Galveston east. However, this pattern is normal for this area as the water is shallow and well mixed most of the year. Week 3 (Aug 25-31): This week represents the week that Hurricane Harvey hit land and dumped multiple inches of rain inland on Texas and western Louisiana. Even though the north and western area of interest (AOI) had trouble with satellite coverage due to cloud cover, of note is the already much larger extent of Harvey related green and turbid green water related to freshwater and river and bay and inlet runoff into the Gulf of Mexico. When compared to the image the week before one notices that already the Harvey water extends an additional 20 to 40 miles further offshore along the coast of Texas compared to the week before the Hurricane hit. Also of note in this image is the evidence of the large counter-clockwise eddy centered offshore near 95°40’W & 27°15’N. 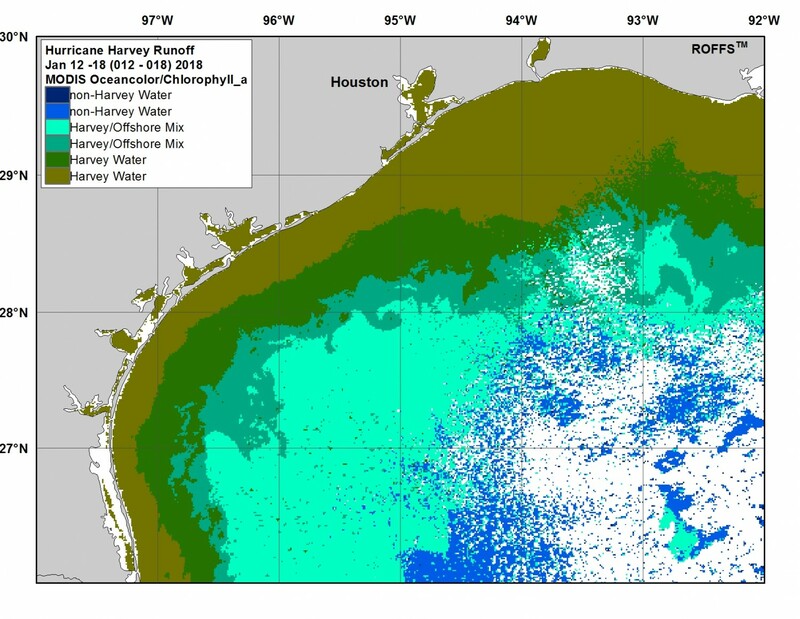 Farther east, there is evidence that the water categorized as “Harvey/Offshore Mix” has already brushed into the Flower Garden Banks National Marine Sanctuary (Flower Gardens NMS) which is located roughly 100 nautical miles (185 km) due southeast of Galveston, TX. Week 4 (Sept 1-7): This next week represents the week to 14 days after Harvey hit and was a good clear coverage through most of this area. 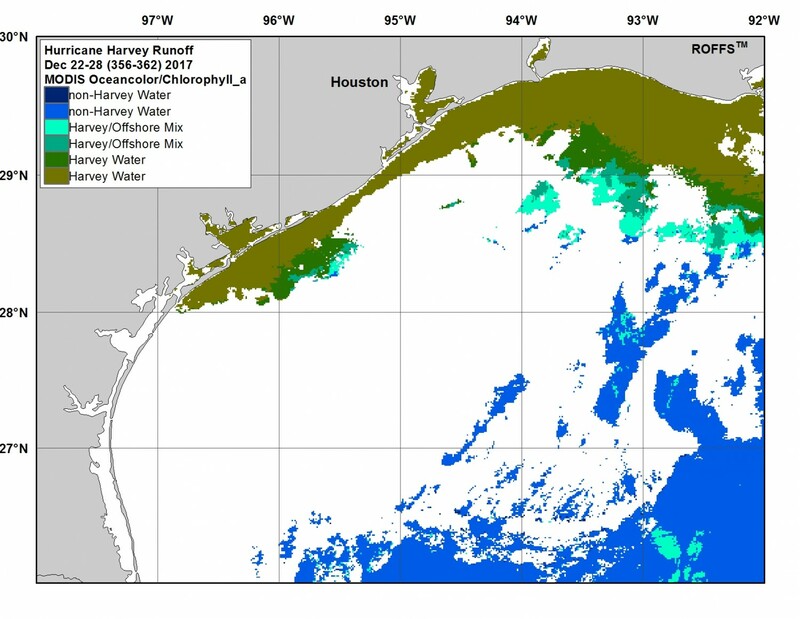 Notice the further evidence of the increase of direct Harvey water, especially the turbid brown water east and northeast of Corpus Christi extending another 5 to 15 miles further offshore specifically between the Houston and Port O’Conner area. 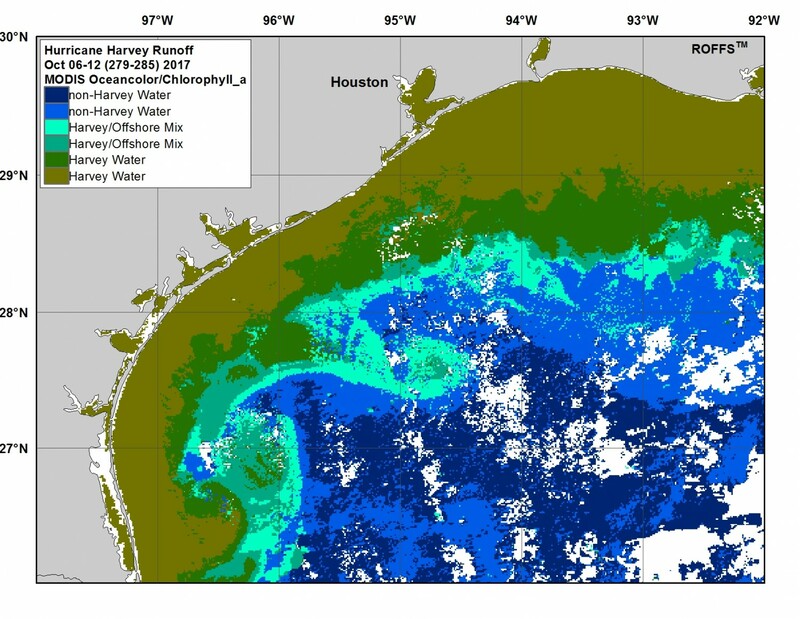 In fact, the spatial analysis shows that the increase of Harvey water increased around 10,000 square kilometers in surface area from the week before within this AOI. Of note the Harvey/Offshore Mix also appears to brush the northern edges of the Flower Gardens NMS area. Week 5 (Sept 8-14): Three weeks after Harvey hit Texas there was great satellite coverage and evidence that the Hurricane Harvey water continues to increase its coverage and surface area offshore. Spatial analysis shows that the Harvey water increased another 9,000 square kilometers in total surface area from the week before within this AOI. Again, notice how the Harvey Water extends and expands 20-30 miles more than pre-hurricane conditions. Although the turbid brown dirtiest water has diluted a bit and decreased in surface area the green direct related Harvey water increased substantially from the week before. Also of note is that a larger amount of Harvey/Offshore mixed water is directly flowing to the southeast over the Flower Gardens NMS. Week 6 (Sept 15-21): There were troubles with clouds in areas, but the overall similar trend of Harvey water continues. 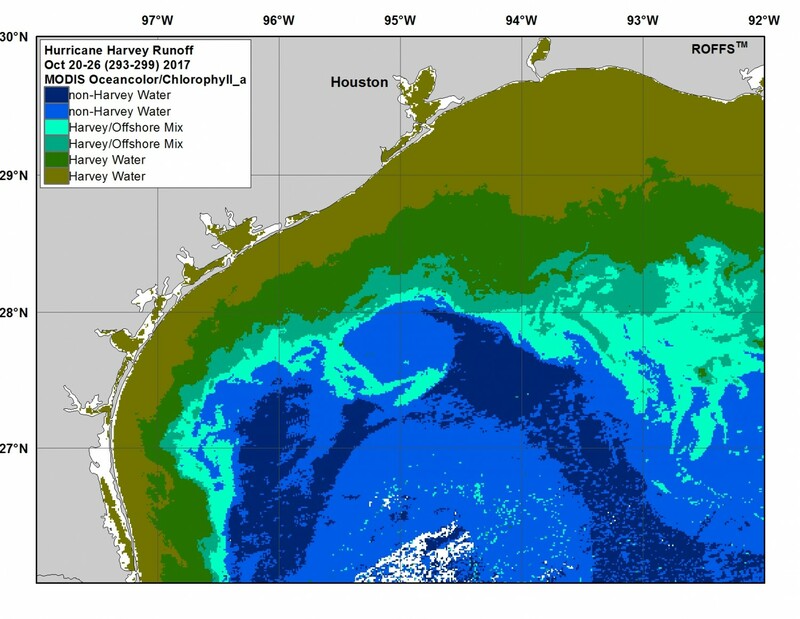 The directly related Harvey water expands farther offshore from the Mexico border to east of Port O’Conner to 100-meter depths in some areas, while the direct Harvey related water decreased slightly offshore of Houston and east of the Houston area. Even though it was cloudy in the area of the Flower Gardens NMS, evidence to the east and west shows that there is still some possible Harvey/Offshore mixed water over that area. Week 7 (Sept 22-28): Even though there were spots of no data and clouds this week in this western AOI, there was the largest amount of surface area extents for both Harvey Water and Harvey/Offshore Mix since the hurricane made landfall over five weeks ago. Evidence that the rivers and inlets and bays are still cresting and spewing larger amounts of dirty Harvey related flooded water into the Gulf of Mexico. Some of this increase in Harvey water extents has to do with the evidence of two counter-clockwise rotating eddies. One centered near 94°45’W & 27°40’N and the other near 96°15’W & 26°45’N. These eddies have interacted with the inshore Harvey water pulling it farther offshore in places well offshore of 100 meter depths specifically east of Port Aransas and southeast of Port O’Conner area. There also remains a larger amount of directly related Harvey water runoff south of Houston and south of Port Arthur out 60-70 miles offshore. Harvey/Offshore mixed water appears to be near the Flower Gardens NMS area this week. Week 8 (Sept 29- Oct 5): This week showed an overall decrease in direct Harvey related water in surface area, but a substantial increase in Harvey/Offshore mixed water well offshore of the 100 meter depths. This trend is evident the west AOI especially where the previously mentioned eddies continue to pull Harvey related water offshore and mixing it with the bluer non-Harvey water. This week there is also evidence of Harvey/Offshore mix water directly over the northern Flower Gardens NMS area as the Harvey mixed water continues to flow to the east-southeast in the area east of 94°15’W. Week 9 (Oct 6-12): This week the pattern and extents look similar to the week before, however, the substantial increase in Harvey runoff water from the previous two weeks indicates that even though the storm hit over six weeks ago the freshwater runoff continues and the expansion of the Harvey extents have increased to its greatest surface area coverage for this AOI. Of note is the eastern expansion of Harvey water in southern Texas as well as the southern expansion of direct Harvey water southeast of Galveston and south of Port Arthur to western Louisiana by 10-15 miles compared to the previous week. Some direct and mixed Harvey water are in depths greater than 100 meters off the eastern Texas coast. There is trace-scattered evidence of perhaps some Harvey/Offshore mix near or over the Flower Gardens NMS area this week. Week 10 (Oct 13-19): This week there was a slight overall decrease in surface area extents of both Harvey water and Harvey/Offshore mixed water. However, there was some cloud cover trouble in the southern AOI. Of note, is the area east of 94°30’W where the drift and expansion of the direct Harvey water and Harvey/Offshore mix continues to move offshore and even deeper than 100 meter depths in some locations, especially offshore of western Louisiana. This is evidence that as the storm hit southern Texas to Houston area first then slowly moved north then northeast that the freshwater Harvey runoff first crested and increased between the Mexico border to Galveston area, and now the area southeast and east of Houston is catching up. Harvey runoff water into the northwest Gulf of Mexico continues to increase and drift offshore east of 94°00’W. There is direct contact of Harvey/Offshore mixed surface water over the Flower Gardens NMS this week. Week 11 (Oct 20-26): There was good satellite coverage and lack of clouds this week for a good overall look. This week marks the new peak surface area extents of both direct Harvey water and Harvey/Offshore mixed water in this AOI. However, looking at the trend from the previous two weeks, this is largely due to the sizable increase of Harvey related water east of 95°00’W while the overall extent west of 95°00’W remains similar to the previous two weeks. This is further evidence of the delay of nearly two weeks between the peak runoff of Harvey water west of 95°00’W and the start of the peak Harvey runoff east of 95°00’W. In the area south of Galveston to south of Louisiana notice the large amount of Harvey/Offshore mixed water pulling offshore and south especially east of 94°00’W. This week there is increased amounts of Harvey/Offshore mixed water directly over the Flower Gardens NMS area. Week 12 (Oct 27 – Nov 2): This week there were problems with a lack of satellite coverage due to clouds. Therefore, the total surface area of Harvey related water decreased. However, looking closer into the overall extent and eyeballing where the Harvey related water is located from the previous two weeks and the following week, one can see the overall extent of Harvey water is similar to the week before in surface water coverage. 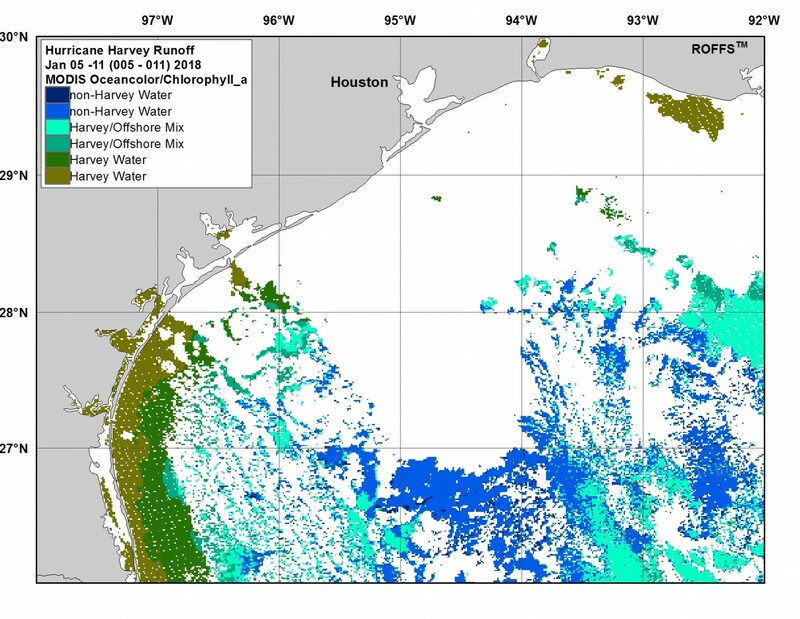 The Harvey and Harvey/Offshore mixed water continues to remain prevalent east of 95°00’W and moving offshore, while there begins to be evidence that the Harvey related surface area coverage of water is decreasing especially between the Port O’Conner to South Padre Island area. This week suggests there is still some Harvey/Offshore mixed water over the Flower Gardens NMS area. Week 13 (Nov 3 – 9): The overall trend was a decrease in direct Harvey water surface area and a considerable increase in Harvey/Offshore mixed water. However, this may be affected by the trouble with cloud cover and lack of satellite data coverage in the northeastern AOI. Of note is the continual decrease in surface area of direct Harvey water in the area west of 95°00’W and especially west of 96°00’W. There are larger amounts of Harvey/Offshore mixed water in the western AOI this week that may be wind related. There is no evidence of Harvey related water over the Flower Gardens NMS this week. Week 14: (Nov 10 – 16): There was good overall coverage and a lack of clouds and evidence of a considerable increase in direct Harvey water from the week before. This is mainly related to the larger amounts of Harvey water south and east of Galveston area with a slight increase in Harvey water offshore of Corpus Christi to the Port O’ Conner area. There is also larger amounts of Harvey/Offshore mixed water especially pulling south between 92°00’W and 93°00’W including directly over the Flower Gardens NMS area again. Of note there is no direct Harvey water deeper than 100 meters at this time. It is also of note, that the turbid brown water may have been at its peak at the end of October, but the increased amount of greener directly related Harvey water is still increasing overall and dominates the signal of the direct Hurricane water starting toward the beginning to middle of November. Week 15 (Nov 17-23): Three months after landfall, spatial analysis finds that this week marks the official peak of the extent of surface area of direct Harvey related water from Hurricane Harvey during this 25-week study period. Of note is the dominant signal of green water and direct Harvey water with its largest coverage since the hurricane made landfall specifically east of 96°00’W and the area offshore and east of Port. O’ Conner. 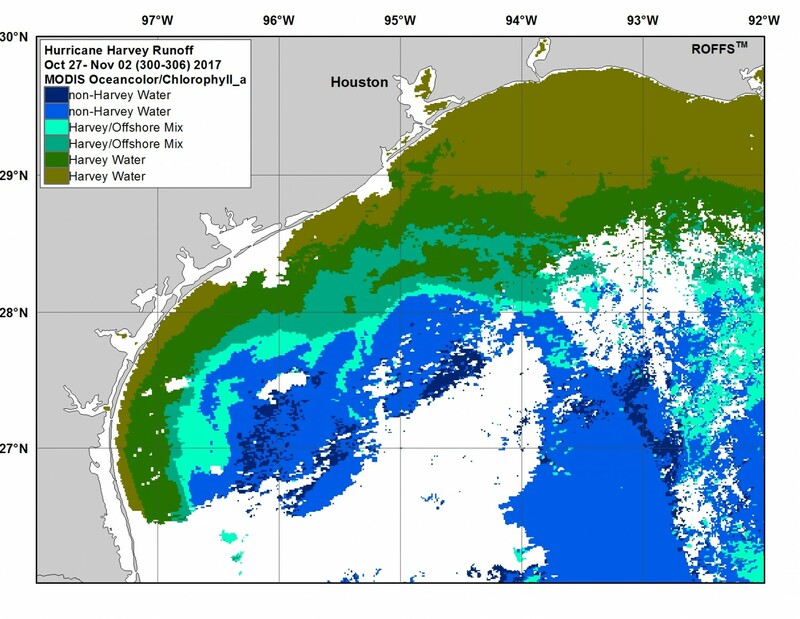 However, there was an increase in extent in Harvey water especially the greener water west of 96°00’W along the coast of Texas as well. There is evidence of Harvey/Offshore water mix over the Flower Gardens NMS this week. Week 16 (Nov 24-30): This week continues the two-week peak of the surface area coverage of direct Harvey water in this AOI. 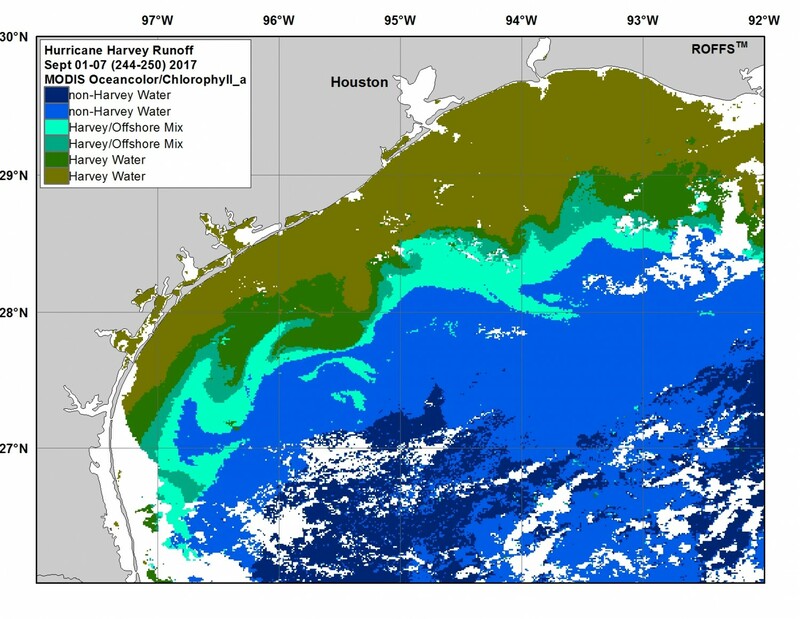 It continues to show that three months after Hurricane Harvey made landfall, the effects and runoff of the freshwater flow and expansion into and within the Gulf of Mexico are still evident and effecting the life cycle of many species and water quality over large areas in the Northwest Gulf of Mexico. It is of note that the pattern looks very similar to the previous week with the majority of the water flow appearing to be to the east and southeast especially east of 95°30’W. There is a push of Harvey water offshore and further southeast of Port Aransas into areas deeper than 100 meters. There is also continued evidence of Harvey/Offshore mixed water over the Flower Gardens NMS area. 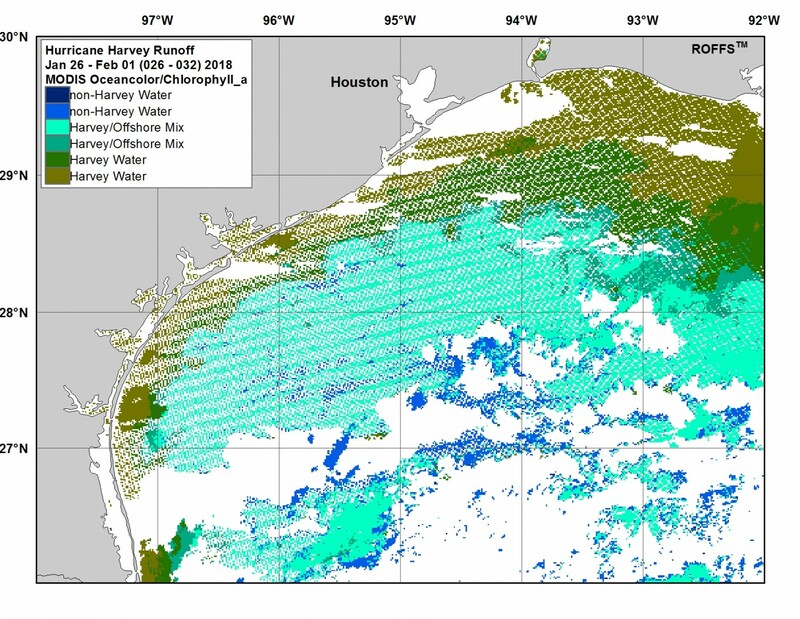 Week 17 (Dec 1-7): Although cloud cover was an issue with satellite coverage in the western AOI, ROFFS™ continues to notice the trend of near peak Harvey water and Harvey/Offshore mixed water especially in the area east of 96°00’W and continued flow and expansion of the Harvey/Offshore mixed water south and offshore between 95°00’W and 93°00’W including directly over the Flower Gardens NMS area. Week 18 (Dec 8-14): This was another good coverage week and represents the end of the four-to-five-week peak of Harvey water surface area in this AOI; in fact it is the second highest surface area of direct Harvey water during this 25-week study. 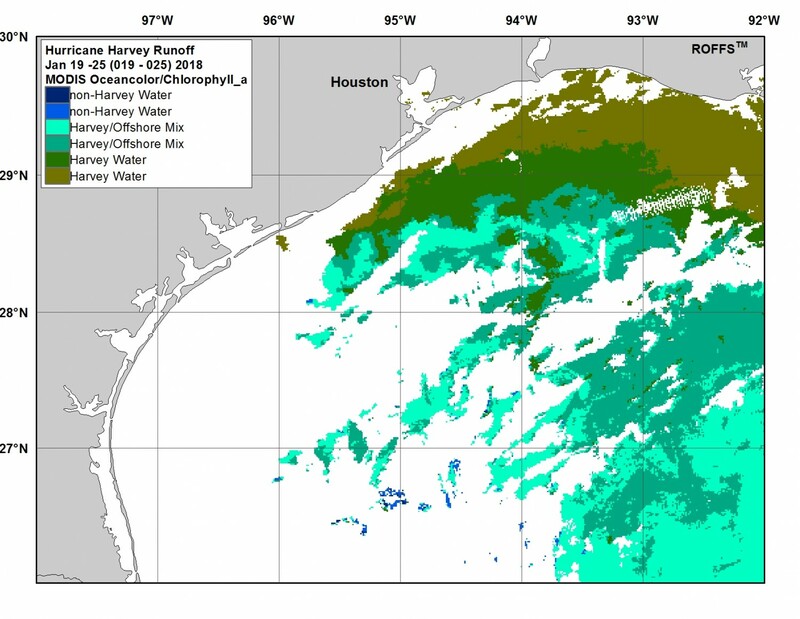 Of note is the larger amount of green Harvey water in the east and especially the southern expansion of Harvey/Offshore mixed water farther south than it has ever been and well offshore of the 100 meter contour and directly over the Flower Gardens NMS. There is likely a larger offshore eddy centered somewhere near 93°50’W & 27°10’N pulling this water south and offshore. Also of note is the larger extent of green and turbid brown Harvey water extending south of western Louisiana during this week. Overall, this marks the end of the peak period of Harvey water extents after Harvey made landfall nearly four months ago. It is of note that the peak temporal range of the Harvey related water and surface area west of 95°00’W was in the late October to beginning of November period, while the peak of the surface area of Harvey related water east of 95°00’W Galveston/Houston and east was mid-to-late November and into the beginning of December. Week 19 (Dec 15-21): After mid-December it is worth mentioning that there was lots of cloud cover in most weeks and it was difficult to get a good read of the trend and follow the Hurricane Harvey related water accurately. So keep in mind to look at the overall extents related to the previous weeks in November and early December to pick out the overall extents and coverage. This week starts the period of time throughout the remainder of the weeks of this project that the overall direct Harvey water starts a noticeable decline in surface area. This signifies the start of a return to normal conditions and evidence that the direct Harvey water is starting to mix out within the water columns and starting to reduce the effects of pollution from the Harvey freshwater runoff plumes. This week most of the cloud cover was offshore and in the south, so one notices the decline in surface area of Harvey water and the decrease of Harvey/Offshore mix. There is no overlap of Harvey related water in the Flower Gardens NMS area. Week 20 (Dec 22-28): There was significant cloud cover this week, making it difficult to identify the Harvey water and how far it decreased or increased. However, when compared to the previous weeks, it does appear that the direct Harvey water remained similar to the reduced coverage from the week before, particularly offshore of Port O’ Conner and east. Furthermore the trend of the greener water and the Harvey/Offshore mixed water also appears to be similar and perhaps even decreased overall in its extent offshore compared to the previous two weeks. It is unknown but unlikely there is any Harvey related water this week over the Flower Gardens NMS area. Week 21 (Dec 29 – Jan 4): There was significant cloud cover but mainly offshore. Therefore, notice the amounts of direct Hurricane Harvey related water inshore that still appears to extend 40-60 miles offshore of Texas and western Louisiana through most of this charted area especially east of 95°00’W. The amount of Harvey water increased from the previous two weeks, but was similar to the extent two to three weeks ago but still a decline overall from the peak weeks. It is unknown what the coverage of Harvey/Offshore mixed water is offshore this week, but it is speculated that there it little to no contact with the Flower Gardens NMS area. Week 22 (Jan 5-11): Moving into the first full week of January 2018 and into the fifth month of monitoring the Hurricane Harvey water there is a significant amount of cloud cover obstructing satellite coverage this week. The only area viewable of the extent of possible Harvey related water was east and south of Port Aransas/Corpus Christi area. Notice that the direct Harvey water continues to extend about 20 miles offshore of Texas with the Harvey/Offshore mixed water appearing to extend another 30-40 miles offshore in this western AOI. In the east, one can only possibly conclude that the mixed Harvey/Offshore water appears to still extend quite a bit south into the 100 meter depths and south of 28°00’N and east of 93°00’W. There is a possible interaction with Harvey/Offshore mixed water in the Flower Gardens NMS area. Week 23 (Jan 12-18): This was the best coverage and overall clear view of the water in this area in about a month. Notice the large amounts of Harvey/Offshore mixed water especially the blue/green water well offshore of 100-meter depths especially in the west. This week it appears that the Harvey/Offshore mixed water overlaps the Flower Gardens NMS area. Of note is the normal looking distribution of direct Harvey green and turbid brown water in the west, but the increase of this direct Harvey water, especially the turbid brown water southeast of Galveston and south of Port Arthur. Since this is the first clear week in about a month, it raises the question that perhaps the Harvey water could still be near peak or just less than peak extent coverage. Or this week could be related to a wind mixing episode or winter algae bloom that was non-related to Hurricane Harvey water and considered an anomaly. Week 24 (Jan 19-25): This week was again effected by lack of satellite coverage due to cloud cover, particularly in the west AOI. Also, there was trouble with calibration and artifacts and it appears that there may be some false green/blue and blue/green Harvey/Offshore mixed water further offshore in the eastern-charted area. However, it is quite possible due to the trend 4-6 weeks ago that the Harvey/Offshore mixed water may indeed have extended and moved farther south and if that is the case it is indeed back over the Flower Gardens NMS area as a higher concentration of Harvey related water. This week remains inconclusive on the overall extent of Harvey related water due to the lack of data. Week 25 (Jan 26 – Feb 1): This last week of Hurricane Harvey water observation also had a lack of satellite coverage and trouble with calibration due to the lack of data and cloud cover. However, of note is that the overall trend does look similar to the previous two weeks with a large amount of Harvey/Offshore mixed water extending well offshore of the 100-meter depths and over the Flower Gardens NMS. Overall, it continues to appear the direct Harvey water is decreasing in the west and remains similar and slightly decreasing in the east compared to the past two weeks and from early to mid-December. However, due to the lack of coverage and clouds, there is a chance that there is some false blue/green and green/blue water offshore. It does appear that the direct Harvey water continues to be prevalent south of western Louisiana. There is an overall decrease in directly related Harvey water since the beginning to mid-December. 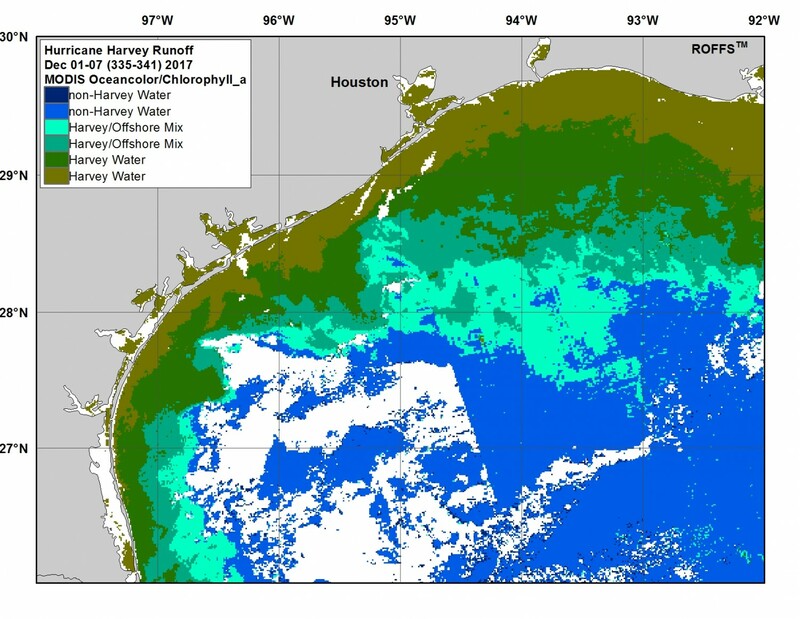 * It is of note that ROFFS™ continued to monitor the water during the remainder of the winter and into spring in the Northwest Gulf of Mexico. By late spring, early summer (May/June), any sort of signal of direct Harvey water has all but dissipated and the extents of these water categories appeared to return to normal. In fact, there were larger amounts of bluer water relatively far inshore by late spring and early summer and this abundance of bluer water trend remained throughout most of the summer.